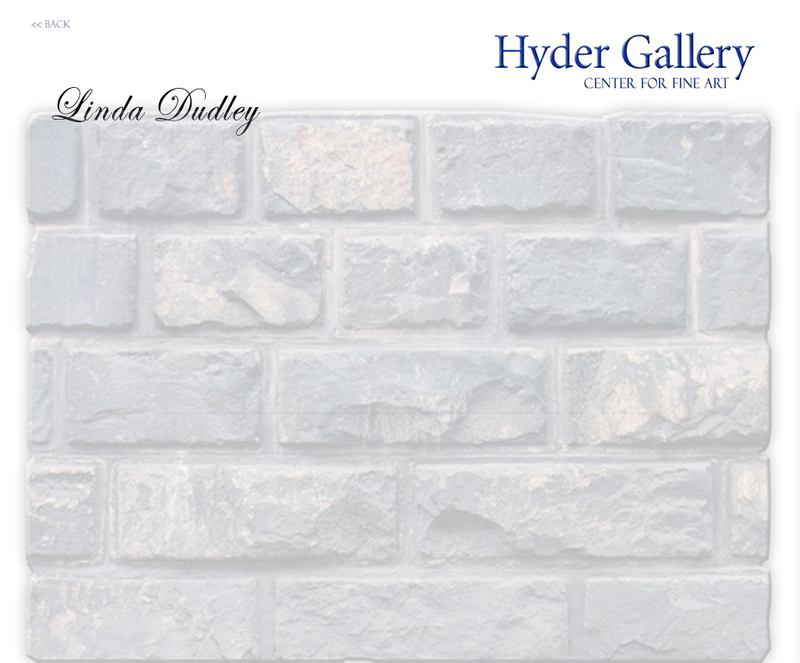 Linda Dudley has always explored art in some form. As a young child, of College Park, Maryland, playing in the mud was an exploration of the tactile quality of mud in an effort to feel and understand the dimension of the substance. Today as an accomplished fine art painter, she explores those memories as an exercise in how to present something felt, into a visually appealing two dimensional surface. From the swirling colors of her kindergarten finger paintings to her high school stage design her work has been widely collected. Linda sold her first piece of art at her high school art show to a collector who said" Linda is extremely talented and I see her going a long way because of her artistic passion”. Linda received her Art Education from the University of Maryland and for thirty five years taught the arts for high school, elementary and early childhood children. Since her retirement from public service her artistic passion has fast tracked her fine art career.
" I see beauty in the simple shapes, shadows and light within the scenes that God has formulated." said Linda. She went on to say, " I am moved by nature. When I see something that I am drawn to paint, it is because I am feeling it emotionally as well as artistically. Catching that fleeting moment in time whether it is the setting sun or the perching of the pelican upon the rocks, causes me to feel deeply about the world I am observing." Linda approaches each painting systematically working from her own photos. Her photos are but a tool in her process. As she rearranges, eliminates or adds items in her photos, she develops a composition based on a good notan design. The notan design provides a rhythmic pattern that builds the framework of a painting into an arrangement of light and dark. This in turn offers a pleasing composition. This allows the viewer to see the painting as a whole expression that pleases the senses through her realistic style. When you view her art , the paintings invite you to smell the fish being cleaned, feel the night air on your skin or the sun on your face. When you experience a work by Linda Dudley it may evoke experiences, sensations or a memory from your past. This is the artists goal, her invitation. 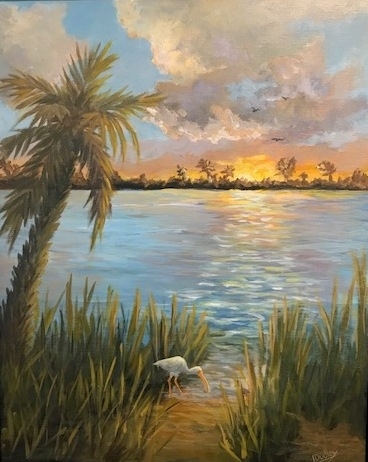 Today Linda Dudley is an active member of the Art League of Orange County Florida. She has held the job of secretary and is currently vice President of the league. She regularly participates in art shows and is continuing her education through the online four year program, "The Virtual Art Academy" founded by master artist Barry John Raybould. As an award winning artist, Linda has received artist of the month in 2013 from the Artist Daily online art group. In 2014 she won the Martha Fowler Award from ALOC. In 2015 she placed third in the Casselberry Art House ALOC judged show. She was also accepted into " Art Around The world" at the Art Gallery Of Viera in 2016 and placed second in the annual ALOC show. Now actively expanding her gallery representation throughout the South East USA, one collector said" We are thrilled with the paintings we have selected and feel very honored to have had a private viewing"
One of Linda's favorite quotes is from Edward Hopper " If I could say it in words there would be no reason to paint". Can you hear the gentle lap of the water on the shore? Can you feel the warming of the damp Florida air? This scene off the coast of Titusville Florida welcomes you to the morning sunrise. It welcomes you with glorious color and wildlife beginning their morning search for food. If you haven't risen early enough to experience this gift, now is the time. Linda Dudley Professional Artist Linda Dudley has always explored art in some form. As a young child, of College Park, Maryland, playing in the mud was an exploration of the tactile quality of mud in an effort to feel and understand the dimension of the substance. Today as an accomplished fine art painter, she explores those memories as an exercise in how to present something felt, into a visually appealing two dimensional surface. From the swirling colors of her kindergarten finger paintings to her high school stage design her work has been widely collected. Linda sold her first piece of art at her high school art show to a collector who said" Linda is extremely talented and I see her going a long way because of her artistic passion”. Linda received her Art Education from the University of Maryland and for thirty five years taught the arts for high school, elementary and early childhood children. Since her retirement from public service her artistic passion has fast tracked her fine art career. " I see beauty in the simple shapes, shadows and light within the scenes that God has formulated." said Linda. She went on to say, " I am moved by nature. When I see something that I am drawn to paint, it is because I am feeling it emotionally as well as artistically. Catching that fleeting moment in time whether it is the setting sun or the perching of the pelican upon the rocks, causes me to feel deeply about the world I am observing." Linda approaches each painting systematically working from her own photos. Her photos are but a tool in her process. As she rearranges, eliminates or adds items in her photos, she develops a composition based on a good notan design. The notan design provides a rhythmic pattern that builds the framework of a painting into an arrangement of light and dark. This in turn offers a pleasing composition. This allows the viewer to see the painting as a whole expression that pleases the senses through her realistic style. When you view her art , the paintings invite you to smell the fish being cleaned, feel the night air on your skin or the sun on your face. When you experience a work by Linda Dudley it may evoke experiences, sensations or a memory from your past. This is the artists goal, her invitation. Today Linda Dudley is an active member of the Art League of Orange County Florida. She has held the job of secretary and is currently vice President of the league. She regularly participates in art shows and is continuing her education through the online four year program, "The Virtual Art Academy" founded by master artist Barry John Raybould. As an award winning artist, Linda has received artist of the month in 2013 from the Artist Daily online art group. In 2014 she won the Martha Fowler Award from ALOC. In 2015 she placed third in the Casselberry Art House ALOC judged show. She was also accepted into " Art Around The world" at the Art Gallery Of Viera in 2016 and placed second in the annual ALOC show. Now actively expanding her gallery representation throughout the South East USA, one collector said" We are thrilled with the paintings we have selected and feel very honored to have had a private viewing" One of Linda's favorite quotes is from Edward Hopper " If I could say it in words there would be no reason to paint". Can you hear the gentle lap of the water on the shore? Can you feel the warming of the damp Florida air? This scene off the coast of Titusville Florida welcomes you to the morning sunrise. It welcomes you with glorious color and wildlife beginning their morning search for food. If you haven<(1)>t risen early enough to experience this gift, now is the time.